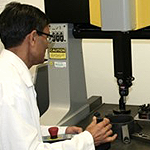 The designers and engineers at API have over 250 combined years of experience in designing parts for plastic injection molding, selecting materials, and processing resins (specializing in engineering and high performance resins). This guide was designed to demonstrate the basic elements of proper plastic part design. Designing a part that can be molded with a "straight pull" or "up & down" motion is a great way to keep the cost of the mold down. A straight pull mold is designed so that when the two halves (A side and B side) of the mold separate from each other, there is no plastic blocking the path of the metal in the direction of the pull. Undercuts on the part cause this blockage of path and require an action in the mold (cams, core pulls, etc.). Action in the mold can have a major impact on the cost (and overall size) of a mold. Proper wall thickness is one of the most fundamental requirements in designing a part for plastic injection molding. Plastic shrinks as it cools which can lead to defects such as sink marks, voids, stresses, and warping. 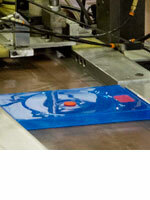 Plastic resin solidifies in the mold nearer to the outside of the part (closest to the mold surface). 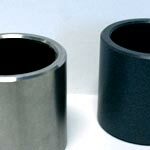 Thick sections of a part tend to pull inward, creating stresses, sink marks, or voids. Since thinner sections cool quicker, stress can build in the part between thinner and thicker sections, resulting in part warpage. Draft is required on all parts in the direction of mold movement in order to allow parts to release or eject from the mold properly. Draft is the angle in which the part is tapered to allow it to release. As the part cools, it tends to want to shrink to the core side of the mold. Adding draft helps the part to release. Most parts or applications require a minimum of 1/2 to 1 degree, however 11/2 to 2 degrees is widely accepted as the norm. Holes can be added to a part for functionality or to reduce overall part weight (coring). Core pins are typically used to form a hole, preventing the molten plastic from filling in that space. Through holes go all the way through a part. Blind holes do not completely go through a part. Core pins for a blind hole are only supported by one end, so there is a greater degree of difficulty in forming them without defect. Forming holes can lead to defects or have a negative impact on aesthetics. 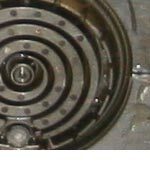 Since the molten plastic flows around the core pin, it can leave a weld line (which may be visible and/or be weaker than the remainder of the part). The depth of a blind hole should be about two times the diameter of the core pin for small pins (less than 3/16") and four times the diameter of the core pin for pins greater than 3/16". Distance from the edge of a hole to a vertical surface (edge or part or rib) or another hole should be at least two times the thickness of the part or at least the diameter of the core pin (hole). Holes created in the direction of the opening/closing of the mold or parallel to the parting line are relatively easy to produce. Holes at different angles can be created, but may require special action in the mold utilizing core pulls or cams which can have significant cost impacts. Bosses can be added to the part design for assembly, locating, or mounting of a part. Improper placement of a boss leads to uneven wall thickness and can have a negative impact on the aesthetics, shrinking, or strength of a part. Wall thickness around a boss feature should be 55%–65% of the nominal wall thickness for thin walls (less than 1/8") or around 40% of the nominal wall thickness if greater than 1/8"
Ribs can be added to parts to add rigidity or stiffness. Adding ribs allows for a part to increase strength and bear a higher load. Ribs too have recommended guidelines to maximize functionality and minimize defects. Rib thickness should be less than the wall thickness. Recommended thickness is 60% to 80% of the nominal wall. Adding more ribs adds more strength or stiffness to a part. It is better to add more ribs than make larger or thicker ribs. Ribs should be spaced at least two times the nominal wall thickness from one another. Rib height should be less than three times the nominal wall thickness of the part. If a thick rib is required, the center of the rib should be cored (cut out) to allow for uniform wall thickness. Radii should be added to angles to prevent sharp corners. Corners can lead to stresses, limit material flow, and often reduce part strength. 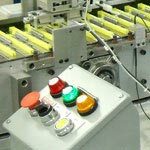 Material selection and processing conditions are equally important factors in the proper design for a plastic injection molded component or part. We understand that initially, material selection may seem overwhelming since there are so many materials to choose from. You can rest easy knowing that API has partnered with resin suppliers for over 60 years and has a multitude of experience in manufacturing plastic parts with even the most difficult-to-process resins. Please see our basic resin guide for a few examples of commodity and engineering resins that API has become an expert in molding. Give us a call today (516) 333-7577 to discuss your plastic design or request a quote today.